‘No reduction in beds’. That’s the claim of bosses at Shropshire Community Trust as they seek to justify closing one of the two wards at Ludlow Hospital. Is this actually true? 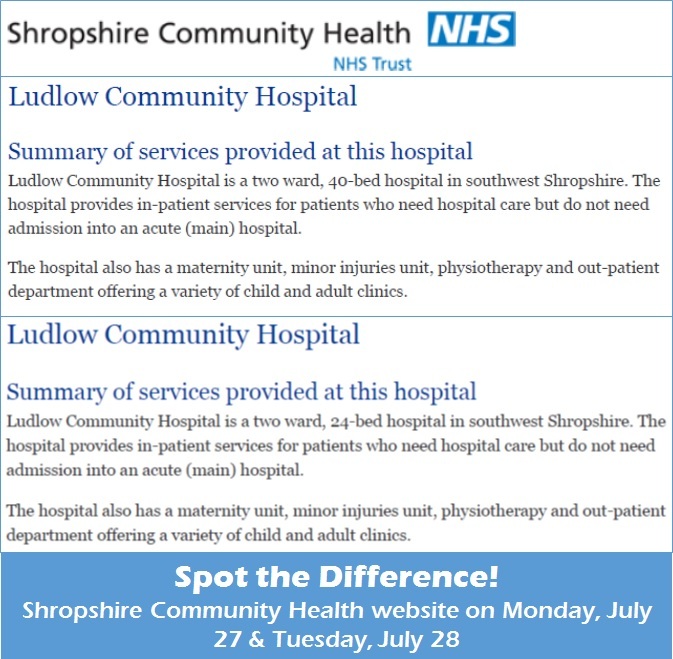 On Monday 27th July, the website of Shropshire Community Trust had this to say: Ludlow Community Hospital is a two ward, 40-bed hospital in southwest Shropshire. By Tuesday 28th July, the website has been amended. Now we are told: Ludlow Community Hospital is a two ward, 24-bed hospital in southwest Shropshire. Learning how to cover up superbugs? The Shropshire Star has reported (“American experts to lead improvements at Shropshire hospitals”) that the NHS is bringing in so-called experts from Virginia Mason Hospital in Seattle in a bid to improve care at the two local hospitals. They don’t report that this is costing the NHS $13 million (over £8 million) at a time when the local NHS is strapped for cash. So what are we going to get for our money?